Turizem Loka is a new family accommodation with an exceptional position in the old town core of mediaeval Skofja Loka, almost in the centre of Slovenia, only 20 km far away from Ljubljana and 17 km from Ljubljana Airport. Our B&B offer you 5 modern equipped rooms (for 1-3 person) and 3 apartments (for 2-6 person). Our surroundings offer numerous possibilities of visiting the rich cultural historical heritage as well as vast options of active spending of spare time by taking up thematic and hiking paths or cycling trails, fishing, skiing on arranged ski slopes and many other activities. Beside accommodation we also offer our guests relaxation in the wellness centre, seminar organization, and we also organize sightseeing and trips to the near and far surroundings. What to see & do : Our surroundings offer numerous possibilities of visiting the rich cultural historical heritage as well as vast options of active spending of spare time by taking up thematic and hiking paths or cycling trails, fishing, skiing on arranged ski slopes and many other activities. 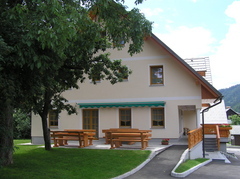 From Ljubljana or Kranj – alight at the Railway Station in Skofja Loka – go by bus to Skofja Loka Bus station and then a 10-minutes (500 m) walk to Stara Loka.